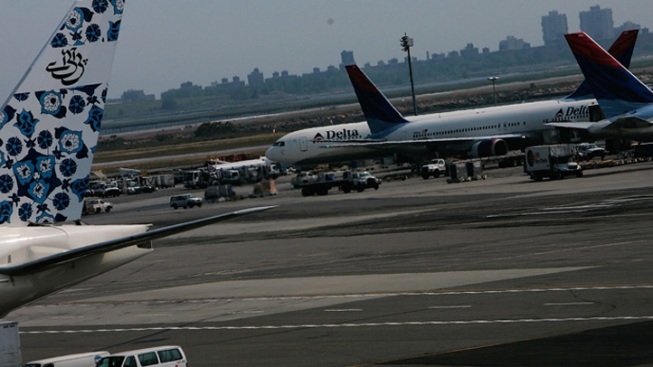 Authorities say they're investigating a security breach at John F. Kennedy International Airport last week, when an employee came upon a trespasser walking on a taxiway. Police responded to a call for an unauthorized person on taxiway AA last Sunday, Dec. 13, the Port Authority of New York & New Jersey said. An employee told police he spotted the man walking toward terminal 8, and when he approached the man to ask for his ID, the suspect allegedly held up a piece of white paper, law enforcement sources tell NBC 4 New York. When the suspect was asked where he was heading, he told the employee, "I'm looking for the A train," according to the sources. Airport employees are getting in without going through metal detectors or having their IDs verified. Pei-Sze Cheng reports. He then allegedly added, "You'd better not say [expletive]." The suspect continued on, and by the time police arrived, they were unable to locate him, according to the Port Authority. Search dogs hunted for the man, but airport activities soon returned to normal. Authorities are reviewing surveillance footage and interviewing witnesses in the case, the Port Authority said. A recent NBC News investigation found that security is gaping at employee entrances to some airports across the country, including at JFK. Employees just swipe ID cards and walk in, with no verification process to match the person swiping the card to the ID. It has raised concerns that someone can use a stolen badge to access secure areas of the airport. An NBC investigation in Dallas revealed more than 1,400 airport security badges were lost or stolen from one Atlanta airport. The Port Authority, which oversees all three local airports, has said it is up to the airline or the terminal managers to monitor employee turnstiles.